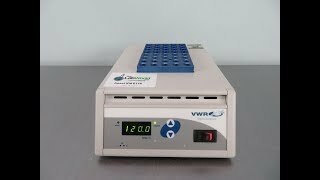 The VWR Dry Heat Block provides steady heating with great uniformity, ideal for applications in immunoassays, incubation, cell and tissue cultures. Each anodized aluminum block maintains constant temperature and can be adjusted mid run with digital accuracy. The microprocessor control panel of this dry bath is situated at the front of the system for easy access. Independent heat blocks are designed to be interchangeable allowing users to set up different configurations such as PCR strips, test tubes, vials and micro plates. The temperature range on these low profile Dry Block heater are ambient to 120°C. These VWR Heat Blocks work great for everyday lab applications, adding power and flexibility, without taking up much of your precious bench space. 12 x 8 x 5"
This VWR Heat Block works great and has passed all inspections. Unit comes with our standard warranty. Contact us today with questions, we're here to help.